Singing Star and Stylish Stunner! 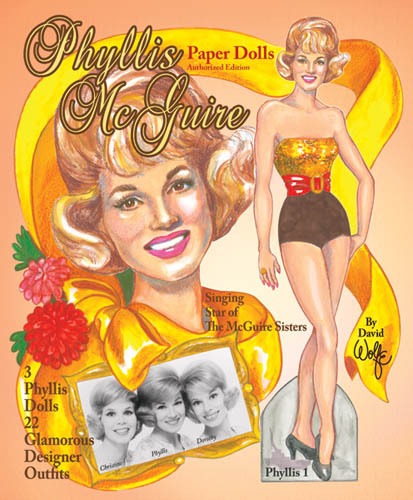 With her sisters, Christine and Dorothy, Phyllis McGuire sang her way to success with mega-hits like "Sugartime," "Sincerely," "Muskrat Ramble," "Something's Gotta Give" and dozens of other songs that garnered The McGuire Sisters many gold and platinum records. Their popularity spanned several decades and started in 1952 when they appeared on Arthur Godfrey's Talent Scouts, singing "Hold That Tiger!" The trio had come to New York City from their small Ohio hometown of Miamisburg where they first started singing in church. Their mother, Lillie, an ordained minister, encouraged her three pretty daughters but it was the youngest, Phyllis, whose dynamic personality catapulted the trio to the very heights of fame. Just four years old when the sisters started singing at weddings, funerals and church revivals, she was destined for the spotlight. She laughingly refers to herself as "the alpha sister." Band leather Woody Herman heard teen-age Phyllis and offered her a spot with his big band. But the youngster told the bandleader that he'd have to hire her two sisters, too, and that was that. Later, Herman bemoaned his big mistake. The three girls headed to New York to try to break into show business, a long shot for certain as they were limited by their budget to a very short stay in the Big Apple. They succeeded in getting a chance on one the '50s most popular TV shows, a talent contest. Their voices, charm and wholesome beauty captivated not only the audience but the show's host, Arthur Godfrey, who offered them a regular spot on his show , a gig they enjoyed for seven years. They quickly experienced a meteoric rise to fame, landing on the cover of Lifemagazine. Hit record followed hit record. (Wickipedia lists over 115 of their records.) They were in great demand for guest spots on popular variety shows hosted by Ed Sullivan, Dean Martin, Milton Berle, Andy Williams, Red Skelton and Perry Como plus scores of other TV appearances over the ensuring years. Coca-Cola hired them for an impressive advertising campaign, a contract so lucrative that it made headlines. The McGuire Sisters performed for five American Presidents from Richard Nixon to George W. Bush and presented to Queen Elizabeth II following a Royal Command Performance. The famous trio officially retired in 1968 and Phyllis continued as a solo performer for a time, singing and acting. She appeared with Frank Sinatra in "Come Blow Your Horn." In 2004, to the great delight of their fans, The McGuire Sisters were reunited for a PBS Special, "Magic Moments of the '50s" and they sang as sweetly and looked as glamorous as ever. Their signature synchronized movements and smooth harmony was always showcased by their appearance. With Phyllis in the middle, the trio looked like beauty queens or fashion models, dressed and coiffed in the very latest mode du jour. The sisters had always been fashion conscious and Phyllis recalls how they hated having to wear "theatrical costumes" early in their TV career. They vowed then to upgrade to genuine high fashion by name designers, and soon, they did. Over the years, the McGuire Sisters' wardrobe was created by the top designers of the day including Sophie Gimbel, Norman Norell, Helen Rose, Galanos, Pauline Trigere, Bill Blass, Bob Mackie, Nolan Miller and many others. All of the lavish performance gowns were exclusive designs because, as Phyllis explains, "After all, we were buying three at a time and that's enough." Today, Phyllis McGuire, whose passion for fashion is unequalled, lovingly guards an unparalleled treasure trove of gowns worn by the trio onstage as well her own personal high fashion wardrobe from great European designers including Pucci, Valentino and Chanel. This breathtaking collection of 180 couture pieces is in pristine condition worthy of a fine museum. It is curated in her own palatial home in Las Vegas where she has lived a high profile social life for several decades. Occasionally she allows the collection to be displayed for charitable fund-raisers. She has donated a wing to St. Jude's Children's Hospital and endowed a scholarship at Hebrew University. She has hosted fundraising events for, among others, the Nevada Ballet, Nathan Adelson Hospice and Las Vegas Art Museum. Harold Koda, curator at the Costume Insitute of New York's Metropolitan Museum describes the collection as a "representation of works from the most important American and European designers in the mid-20th century...one of the most important private collections of couture in this country...preserved so impeccably." Phyllis McGuire herself sees it more personally, saying, "It's all memories. Wonderful memories." Phyllis McGuire... Singing Star of the Super-successful Sister Act and a Fabulous Fashionista!